To celebrate the 100 days mark …. I thought it would be a good time to collate the coverage so far. Occupation Camp in Nottingham is part of a global network of occupy camps, to protest at governments cuts. Critical of growing inequalities. Anti-globalisation, anti-capitalist and in favour of helping to bring about fairness in society. so, in short, just checking. Nottingham’s Market Square was occupied by a gathering of people aiming to show that we will no longer tolerate the corporate greed and Government corruption that threatens our way of life and everything we work for”. They camped overnight and are intending to stay as long as they can. The occupation is part of a worldwide movement of occupations that began on 15th Oct. The occupation showed solidarity with youths from the Jarrow March 2011 who rallied in Nottingham yesterday as part of their journey to London to demand decent employment. Marchers and supporters assembled on the Forest Rec at 12.30 and marched to the Market Square where a rally was held. It is the 75th anniversary of the original Jarrow Crusade, which an attempt to raise awareness of the intense poverty and unemployment in the North East. The marchers are demanding a number of major policy changes by the government to improve the lives of young people and give them a better future. A massive government scheme to create jobs which are socially useful and apprenticeships which offer guaranteed jobs at the end – both paying at least the minimum wage, with no youth exemptions. The immediate reinstatement of EMA payments, expanding them to be available to all 16-19 year olds. The scrapping of ‘workfare’ schemes – benefits should be based on need not forced slave labour. A massive building programme of environmentally sound, cheap social housing. On arrival in the Market Square, it was occupied by a gathering of people aiming to “to show that we will no longer tolerate the corporate greed and Government corruption that threatens our way of life and everything we work for”. On arrival, there was an event were many speakers expressing their concerns. Notts Uncut also did a tour of the usual tax-dodging suspects. They camped overnight and are intending to stay as long as they can. The occupation is part of a worldwide movement of occupations that began on 15th Oct. The occupation showed solidarity with youths from the Jarrow March 2011 who rallied in Nottingham on Saturday as part of their journey to London to demand decent employment. Part of a global movement in solidarity with other occupations across the globe. We aim to occupy the Market Square Area of Nottingham from Saturday 15th October 2011 as part of an ongoing non-violent/peaceful demonstration. Broadly speaking, we aim to show that we will no longer tolerate the corporate greed and Government corruption that threatens our way of life and everything we work for. Currently our government strips away our civil liberties and public services, all in the name of greater profit for banks & corporations who exert far too much influence and control over our supposed leaders. We want to encourage and inspire people to work together towards a fairer society for all, rather than the current system where the rich few get richer and the rest of us get left behind. 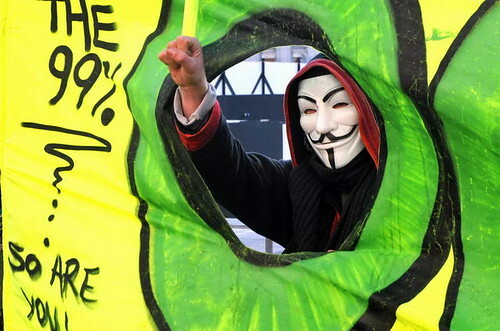 Nottingham Occupy: 4th week & onwards …. In spite of assorted agreements with the police, officers continue to be obstructive to photogaphy in the street. Although the trend of photographers getting hassle go’s up and down over time, It has always been thus! The object of this page is to strengthen your knowledge regarding issues surrounding photography, both in ‘actions’ and subjects in a public place. In situations whether your photographing an action / demonstration, or people and buildings in the High Street …. it has become quite problematic and increasingly so. I think 4 main issues have a bearing here. Policeman and assorted officers don’t want to be photographed, it might show some wrong-doing. People involved in direct action, a photograph might be evidence against an individual breaking the law. The notion that some believe people have a right of privacy in a public place. The threat of terrorism and a photographer might be conducting ‘hostile reconissence’. IS IT LIKELY THAT A PICTURE I TAKE, WILL PROVIDE EVIDENCE TO PROSECUTE ANYONE? I struggle with this all the time and it is central in my mind when photographing activities. It might be argued that it is safer just to take pictures on your holiday and leave a camera at home otherwise. I don’t agree. Those of us who are serious about this media have a more positive motive. Firstly, we sometimes moan about the lack of coverage, issues that concern us don’t get in the main stream media, or, when they do are monstered and rubbished. Many of us have been involved in the ‘alternative media’ in a variety of forms to try and fill this gap. It is a prime objective of the Indymedia Network Project. Should people not have photographed, filmed, recorded or written about events themselves in recent years, vast chunks of history would not have been told or known about. For future activities, I think it is important to show what has been possible in the past. Our coverage should be inspiring to others in the future. Not just the near future either, photographers both professional and casual contribute to our ‘social history’. I want my ‘tribes’ included in this knowledge. Secondly, having said I don’t want to provide evidence to prosecute anyone ….. I do have ‘form’ for providing picture to defend people wrongly accused. In fact, this is where I started during my festival and traveller days. Authorities and policemen in particular are given training in the aspects of how to give authorititive evidence in court. Many times have I seen this ‘blown out of the water’ by a witness giving evidence and showing a series of photographs or video demonstrating the officer lying through his teeth. It’s not only photographs of course, you should make written notes of times, date, places. [who, what, were and when]. Voice recording equipment is much cheaper and available now, dictaphones, mobile phones and the like can be used covertly or obvertly. Now, bearing all the above in mind, you have to be aware of the pressures there are now, when photographing your interests in a public place. As far as I know, there are only two offences that are committed where you can be properly arrested. It is an offence to take photographs or collect information, likely to be of use in terrorism ‘hostile reconissence’ and you are not permitted to take an indecent photograph of a child. Harrasment, causing alarm and distress. Obstruction [obstructing and officer in the execution of his duties]. Seizing equipment and media that might assist in the investigation of crime. [PACE 1984]. The Sect 58a is still one of the most dangerous, since it is in so many peoples mind, that it is an offence to photograph policemen. IT IS NOT. The Metropolitan Police, Photography advice [below] makes it quite clear that this is not true [unless you are a terrorist of course]. They have to have resonable suspicion that you are. Now, on to some advice. It is simple. You can photograph largely what you like in a public place, with a couple of exceptions that I’ve described. BUT, it is complicated in understanding the speaded of guidelines and advices that are now published. The more serious you are about being confident in your photography, the more of this lot you’d want to read. For the casual snapper, the first few links should help.